March on the river Ebro is un-predictable weather wise, but the Carp fishing can be excellent and the Ebro Catfish reguarly caught. Often a rather cool, cloudy day, with the Carp nowhere to be seen can be followed by a day with the temperatures in the mid 70s and the Carp basking in the shallows..By April the river Ebro weather becomes more stable with consistently warmer temperatures and the Ebro Catfish 'waking up' in ever increasing numbers, although the weather can still be cool days with spells of rain. Once May on the Ebro arrives the weather has generally become pleasantly warm with sunny weather being the norm and both the carp, the catfish and the anglers are very happy! Spring water off the mountains means the river Ebro runs fairly high and the water is highly coloured, the Carp and Catfish are now active. A good tip in terms of locating the Carp or the Catfish is to go out for a walk after dark, If the Carp are present you will here them jumping, if the Catfish are there you will often here them 'striking' through the shoals of bleak, or thrashing on the surface. As we enter May the water temperature of the river ebro is rising andthe Carp fishing is very good ,the river is still usually running fairly deep as the melting snow from the mountains feeds the tributaries that run into river Ebro. The real start of the Ebro Catfishing season is often dependant on the overall winter temperatures the Ebro has experienced. Generally a milder winter produces a more consistent start to the Ebro Catfishing season . There are quite a few massive 200 pound plus female Catfish full of eggs present at this time. Although April see's the start of the biggest Catfishing hauls, May is often when the Catfish are spawning so the fishing can be very unpredictable, generally as soon as the Ebro Catfish are finished spawning,there is a feeding frenzy! and people Catfishing can catch huge amounts. December, January and February are great times to go river Ebro Carp fishing, it can be quite cold, often with northerly winds but if you wear the right clothes you will be fine and the Carp fishing in Spain can really warm you up! As you would expect rain sometimes too, but the Ebro still has many sunny days and can see temperatures in the late teens.The water levels on the river Ebro start to increase and become more coloured, although the levels will not peak until the spring with the snow melt from the mountains in Spain and France reaching the river Ebro. Although the Catfish are still be caught at this time of the year, the focus is really on the Carp fishing, these Carp live a very active life and are seemingly always feeding, it is during the winter months that most of the largest captures of river Ebro Carp have been reported with the Carp patrolling the Ebro in huge numbers. As we enter June the daytime temperatures are climbing rapidly and the Ebro Carp and Catfish are very active, for the next few months the temperature it will often exceed 30 degrees, but on most days the river Ebro experiences a nice breeze to take the edge of the temperature. Occasionally there are some spectacular evening thunder storms, these storms are often very welcome in Spain as they really clear the air, then leave some fantastic river Ebro Carp fishing and Catfishing in their wake! 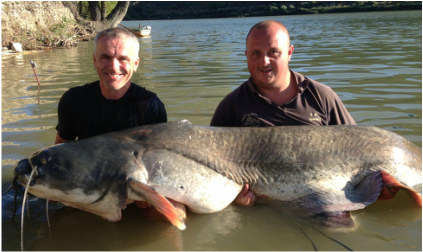 The River Ebro in June, July and August see generally excellent Carp fishing and Catfishing with consistent captures being made. As the water temperature rises higher the Catfish have an increased metabolism and as a result the feed even more. 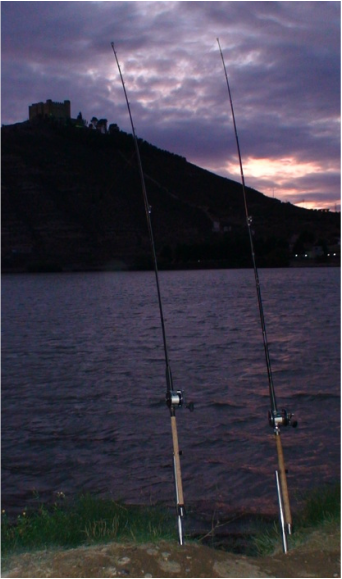 At this time of year the Carp fishing and Catfishing is normally best and more comfortable during the (early) mornings and evenings, but if you can stand the temperatures both the Carp and the Catfish are regularly caught on the river Ebro at all times of the day. In September the weather can still be quite hot, but overall is starting to cool down and the temperatures are gradually getting lower, this trend continues throughout October and November and leads to very pleasant Carp fishing and Catfishing conditions. The winds are often a bit stronger but sunny skies are still the norm. By the end of October the Catfishing fishing starts to slow, but the Carp fishing is just getting better and better and 100lbs plus Catfish are still being regularly being caught. 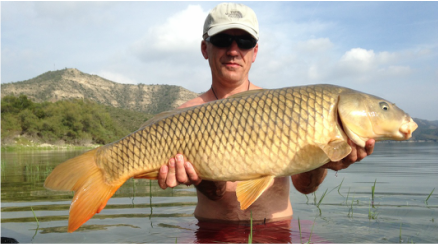 For a lot of Ebro fishing holiday regulars this time of year in Spain is their favorite, if you visit at this time you may well find out why! often overall catches on the Ebro at this time are exceptional.